Whether you are looking to boost your fishing game, or save some money on bait, the best trout lures can help you with both! Fishing lures are designed to entice fish to bite on your line. They are also reusable, making them cheaper and easier to carry around than live bait! We found 10 great trout lure options for all levels of fishing lovers! Before we get into the trout lure reviews, here is what you need to know first. Pieces: Some lures are sold as one lure each, so you can create a custom set with the colors and sizes you want. Other lures come in sets, so you can buy a variety of lures for your next fishing trip! Material: Lures are made with different materials, which can affect how they move. Metal lures sink fast and reflect sunlight well to catch deep-water fish. Plastic and wood lures float and bob to attract fish to the surface to catch them. Storage Case: Many of the lure sets we reviewed come in their own convenient storage case. A small case or tackle box is great to keep your lures well organized, so they’re easy to access when you need to swap them out. Lure Weight: Depending on the size of fish you’re trying to catch, using the right weight of lure can help your chances. Lighter lures are great for small, fast fish, while larger lures can catch big fish without breaking the fishing line. Diving Action: We reviewed lures that are fast-sinking, slow-sinking, and spinners to give you a variety of movement options. The diving action you will need depends on the water type you’re fishing in and the type of fish you’re looking to catch. Lure Size: Just like weight, the lure’s length will vary depending on what kind of fish you are looking to catch. Smaller lures are great for catching smaller and fast-moving fish, and larger lures are best for catching larger and slow-moving fish. Now that you know all about what features fishing lures have to offer, let’s find you the best trout fishing lures for your next trip! We reviewed 10 different fishing lure options, from simple kits for beginners, to electronic fish that light up at night! If you don’t have time right now to read about all 10 of them, don’t worry! Check out our Top Pick and Budget Pick now, and then come back later when you have more time! 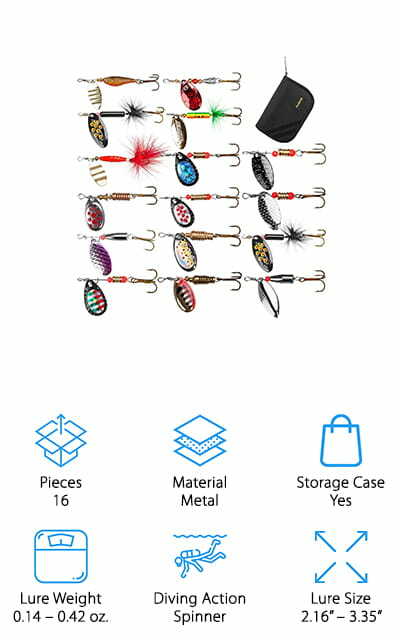 Our pick for the best trout lures goes to this kit of 16 lures from PLUSINNO! We chose this as our Top Pick because it comes with a variety of spinner-style lures of different lengths and weights that are great for catching trout and bass. Each lure is brightly colored and has a variety of features that trout will be attracted to as the lures spin along freshwater or saltwater. The sharp hooks on each lure will catch fish quickly and cleanly, which reduces the chances of them wriggling away. 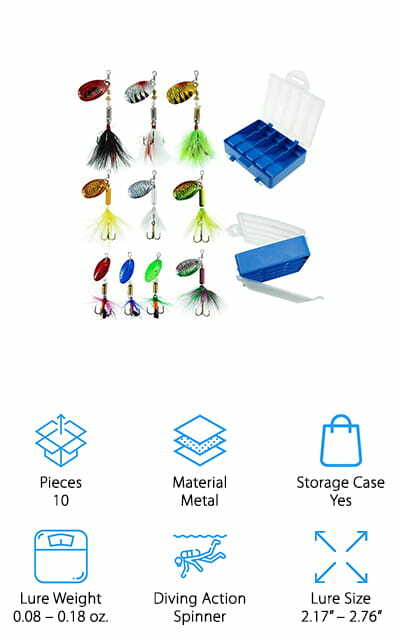 We also like that this set of lures comes with its own carrying case, making it easy for you to reload your fishing line quickly. It has a carabiner on the corner, which you can easily hook up to your belt loop, or add it to your fishing backpack for easy access! We think this would make a great gift idea for each of the fishing aficionados in your life! If you’re looking to save some money on your fishing gear, consider picking up a few of these versatile and realistic lures from Dynamic Lures! These trout lures are a great budget option because you can use them to catch a wide variety of fish, including trout, bass, walleye, and carp. No need to buy a bunch of specialty lures when one will do the job! These are also super durable, so you can clean and reuse them several times without them cracking or peeling. The slow-sinking lures also stand upright in the water, and they give off a slight vibration to mimic live bait to attract large fish. We also like that each trout lure has 2 hooks on it, which increases your chances of catching a fish and keeping heavier fish on the line. We think these are the top trout lures for fishermen who want to get the most out of their equipment without breaking the bank! 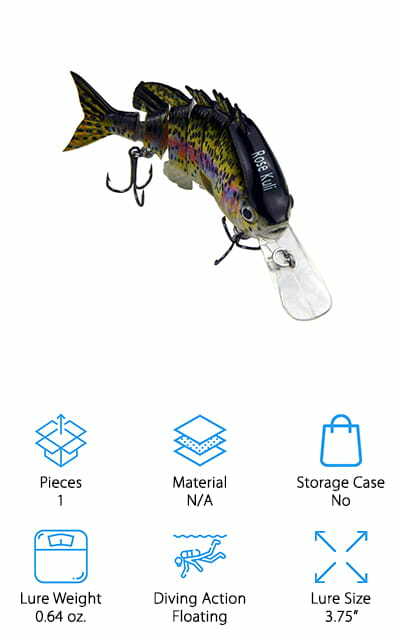 Another great set of fishing lures to pick up for your next trip is from Tbuymax. This set of 10 lures is perfect for big fish, such as trout, bass, salmon, and more. They work well in freshwater and saltwater, so you can save some money by only using one set of lures! The set comes with 2 cases that each fit 5 lures, so you can keep your lures safely organized and easy to grab when you need to reload. Each spinner lure is designed with bright and shiny colors to attract the fish, and they give off a slight vibration that is just like using live bait. Four lures have rooster tails you can use in freshwater and saltwater to entice fish even more! Each lure has a heavy-duty, sharp treble hook to snag fish quickly and keep them from breaking the line. These are the best trout lures for small streams, lakes, rivers, or wherever you fish! If you’re looking for the best trout lures for streams and rivers, these lures from Rose Kuli are great for anglers! 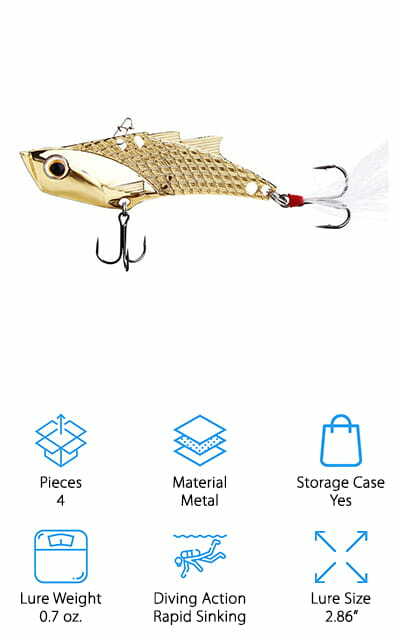 These large, lifelike fishing lures work well in both freshwater and saltwater to trap large predator fish like trout, salmon, bass, and much more. The bodies have joints that slither around just like a live fish, and they are painted to look just like real bait you may see on the water! They even have 3D holographic eyes that make them look even closer to the real thing! For anglers, the gravity ball in each lure allows you to cast out further, and it makes a bit of noise that attracts the fish to the lure. Each lure has 2 treble hooks, so you can catch heavy fish, even if they only manage to grab your lure’s tail! Instead of spending a lot of money on live bait, grab a few of these lures to last through fishing season! Want to get the best trout lures for your buck? This set of 30 lures has plenty of options to help you catch a variety of fish without spending a fortune on fancy lures! Each lure is carefully made and beautifully designed to be both rapid-divers and spinners to attract the most fish. They come in a variety of sizes and weights, so you can choose the best lures for your location or the fish you want to catch. Each lure has a sharp hook that grabs the fish and keeps it on the line securely while you reel it in! 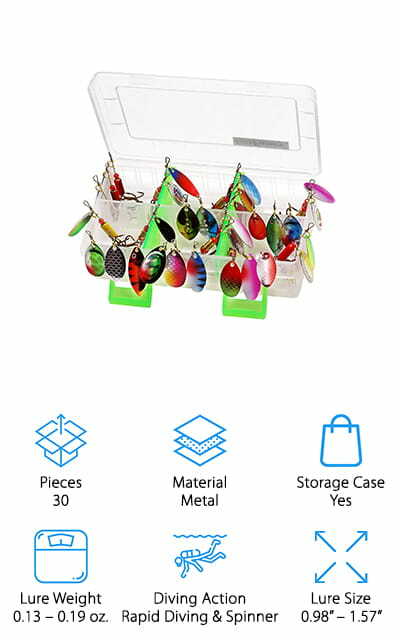 To keep your lures safely packed away and organized, this set comes with a small tackle box with 4 moveable dividers. You can easily access your lures to reload, and the tackle box will easily stow away in your fishing backpack, cooler, or camping bag. We think this would make a great gift for beginner and experienced fishermen alike! 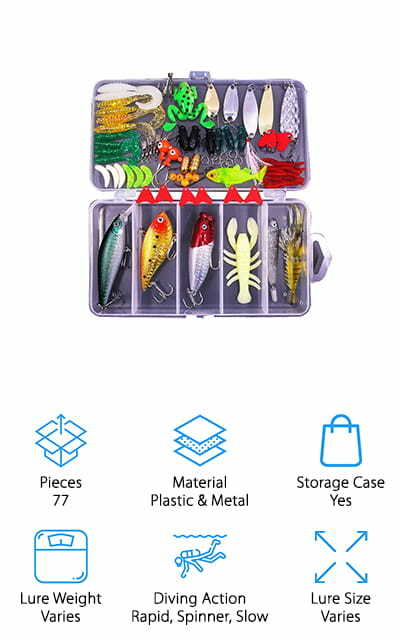 If you like to fish in a variety of waters, and for a wide variety of fish, this 77-piece set from Saimanqiu comes with the best rainbow trout lures, worm lures, hooks, and more! This set comes with a wide variety of lures, so you can switch them up as you need to! It comes with plastic bait made to look like worms, flies, frogs, shrimp, and small fish to catch smaller fish. There are also lifelike fish to catch larger bass and trout, and spinners to grab a variety of larger fish too! We also like that it comes with extra hooks and accessories to customize your bait or replace broken pieces on the spot. The whole kit comes in a small tackle box that keeps everything secure and organized – and it has extra room if you want to bring along even more lures! These are the best trout lures for rivers, streams, lakes, and anywhere else you fish! 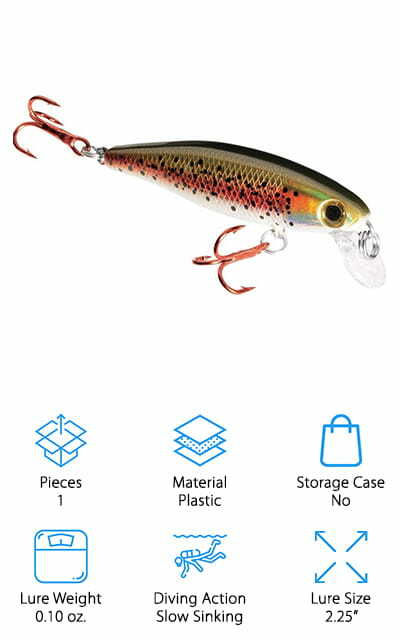 If you’re looking for the best lake trout lures for trolling, consider picking up this set of 4 flashy lures from YONGZHI! You can hook up one or a bunch of these lures to attract as many fish as you can for maximum success! The lures work well in both freshwater and saltwater, and attract large fish like trout, bass, pike, and more! 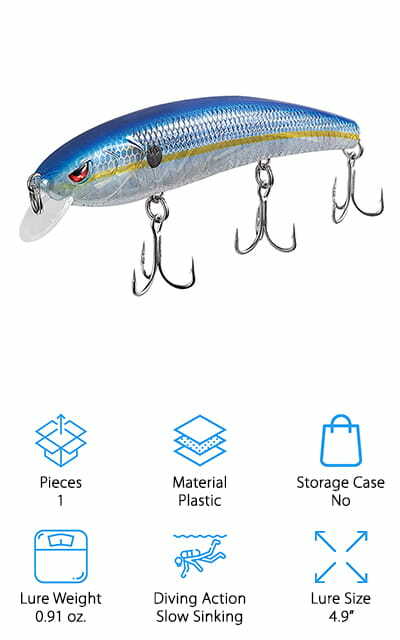 These metal lures are shiny and bright, making them perfect for trolling or fishing on a sunny afternoon on the lake! The rapid sinking movement and internal vibrating mechanism will get the attention of fish that are deep in the water or far away. We also like that each lure comes with a feather tail to attract the fish, and each lure has 2 treble hooks to increase your chances of a catch! This set also comes with a carrying case to keep your lures clean and organized in your tackle box, fishing backpack, or fishing vest! 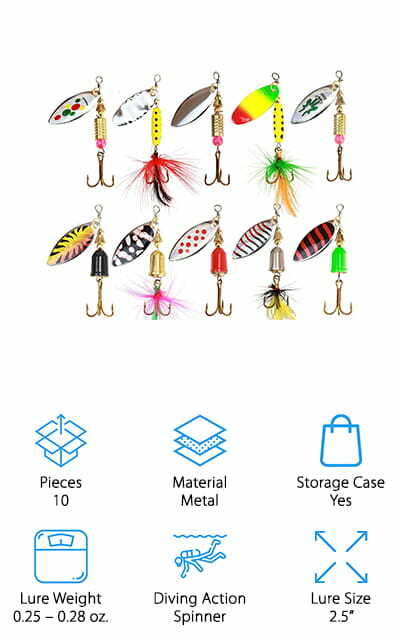 Next up is this set of 10 spinner lures from FouceClaus that would make a great gift for the trout fishermen in your life! This kit comes with lures in a variety of sizes and weights to attract trout, bass, pike, salmon, and other freshwater and saltwater fish. Each lure is brightly colored and has a bright strike-attractor sleeve to attract the eye and reflect light to attract attention. They also come with brightly colored tails that entice fish to keep going after the lures. As the fish grabs at the feathers, the sharp treble hooks that lie underneath the tail immediately hook it securely. The lures come in a small tackle box that keeps each lure securely packed up to prevent tangling, and make it easy to swap out lures as needed. We think are the best brook trout lures to give as a gift for Father’s Day, birthdays, or to encourage beginners to get out there and fish! Want to bring technology into your fishing experience? Consider investing in one of these mechanical trout lures from TRUSCEND! These lures have a lot of fun features to make your fishing trip more successful – and hopefully more fun, too! Each lure is made of translucent plastic and painted to look just like live bait. These lures don’t just reflect light to catch fish – they make their own! The lures use rechargeable batteries that connect to a USB port to charge in 2.5 hours, and they hold a charge for up to 12 hours. Each lure has a light, which makes night fishing easier because you can clearly see the bait while in the dark. They also vibrate to attract large fish like bass, pike, salmon, and trout. To make catching a large fish easier, each lure has 3 hooks to ensure you grab any fish that bites! These would make for a fun upgrade to your extensive fishing lure collection! Last up are lures we think make the best brown trout lures and best speckled trout lures for your next fishing trip! These lures are made for using the stop and go action or jerk method to catch fish in streams and ponds. They are weighted especially for using these methods because they stay underwater when you stop quickly, instead of floating up. Each lure also has a small rattle inside the body that makes noise to attract the fish, just like live bait would do. 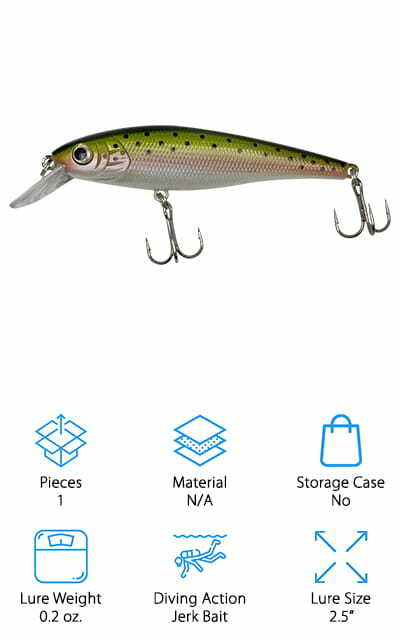 We also like that you can buy these lures in 6 different colors and patterns, so you can find lures that look just like the live bait you would normally use. Using lures instead of live bait is more economical because you can reuse them, and they’re better for the environment because you’re not encouraging mass fish farming. You can feel good knowing you can catch the fish you want without spending a lot!